While it may not be as big and bold as other online casinos, 10Bet is a reliable brand that has consistently delivered for players since it was first founded in 2003. Offering a broad selection of games, from classic slots and jackpots to high stakes and live casino, this is a multi-software setup that opts to stick to the basics, using a contemporary platform to showcase a collection of gaming options for players with a variety of interests. There is a solid selection of games here that are regularly updated and added to, and the casino sets out its wares in a no-nonsense, straightforward way. It is ideal for those who just want to get into the gaming. So, if you are seeking an online casino that delivers on game play without the flashy extras that can be found on other sites, 10Bet is the casino for you. As well as the main welcome offer, there is an additional welcome bonus for those playing the live casino. When you sign up to play against a live dealer on the 10Bet website, you can get a 100% instant match bonus when you deposit up to £100 and enter the GOLIVE100 Bonus Code. Take a look at the website for more details. There are also regular themed promotions to look out for. Daily Delights presents a pick of the promotions that take you through the week, while other seasonal bonus treats and cash value prizes are regularly added to and updated. Check out the promotion page to find out what the latest offers are. Unlike some other online casinos, 10Bet doesn’t have a loyalty points scheme in place, so if you enjoy building up your points and rising through the ranks this probably isn’t the one for you. 10Bet is powered by a combination of software providers including Microgaming, NetEnt and QuickSpin, while Evolution Gaming powers the live casino section of the site. By using these well-known software names, 10Bet can give you access to over 500 games and offer players a gaming experience that is constantly being reinvigorated. If you have a preferred software provider, the 10Bet Casino landing page offers the opportunity to filter your game according to the software, meaning you can enjoy a solely Microgaming experience while on the site or you can switch between the providers so you can really benefit from the varied gaming experiences. In addition, this is a flash casino, meaning that no downloading is required and it can be accessed via your browser with ease. If you are playing on the go, some of the slots are HTML5-enabled, so these can be accessed via an app or browser on your mobile or tablet. In terms of the games themselves, 10Bet’s straightforward main page details the different game categories and offers a search box should you want something specific. Take your pick from options including ‘video slots’ and ‘live casino’ before focusing in on one of the many games on offer:Video Slots – Choose from 401 titles in this section, including Game of Thrones and Lara Croft Tomb Raider. Jackpots – If you are playing for the big-hitting jackpot games, take your pick from 23 different games. Titles such as Mega Moolah and Fruit Fiesta all pay out for those in search of the big prize pot. Video Slots – Choose from 401 titles in this section, including Game of Thrones and Lara Croft Tomb Raider. Roulette – There are 18 roulette games at 10Bet, from French Roulette to 3D Roulette, which offers something a bit different. Blackjack – Take your pick from 16 blackjack titles available. Head Stateside for Atlantic City Blackjack or try Double Exposure Blackjack. Video Poker – There are 10 video poker games in total, including Joker Poker, Deuces Wild, and All American. High Stakes – Feeling daring? Try your luck at one of the eight high stakes games, where you can try Pontoon Pro or Caribbean Stud Pro. Live Casino – There are 10 games to play in this section, each offering the chance to play against a live dealer. Table Games – Choose from 47 table games that vary from Casino Hold ’Em to English Roulette. 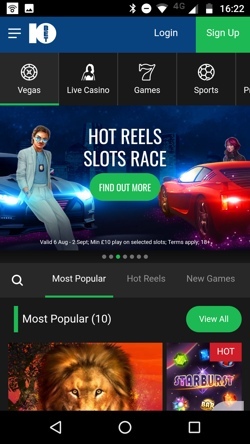 The mobile gaming options are run by 10Bet Limited and are available as an app and a fully scalable mobile site, however the design of the app itself reflects the layout of the desktop site so players can enjoy a similar experience no matter how they access the 10Bet selection of games. If you want to be able to play your favourite game on the go, you can use the desktop site to check ahead and see if your preferred game works on the app. Just scroll to the game you want and look for the mobile phone icon. From there, you can then opt to download the app to your device. Once downloaded – a process that is fast and straightforward – the app’s appearance echoes that of the desktop site and the categories are the same. Everything you need can be accessed by selecting the three dashes icon in the top left of the screen. When selected, a menu slides across detailing the options available, offering a smooth, neat way of finding what you need. There are showier mobile apps out there that have more features, yet 10Bet’s mobile gaming solution offers easy-to-use functionality and maintains the no-nonsense approach that the brand presents on the desktop site. 10Bet Casino offers a variety of forms of payment. Take a look at the at-a-glance guide to the main payment options and to find out more about the different terms and conditions, head to the website. 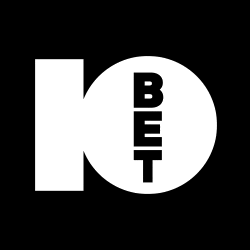 10Bet was established in 2003 and is owned by Malta-based Blue Star Planet Limited, which also owns 10Bet.ie, the Republic of Ireland’s version of the site. Over the course of the past 15 years, the site has expanded its focus, shifting from sports betting to its online casino and investing in software providers that present a plethora of gaming options. 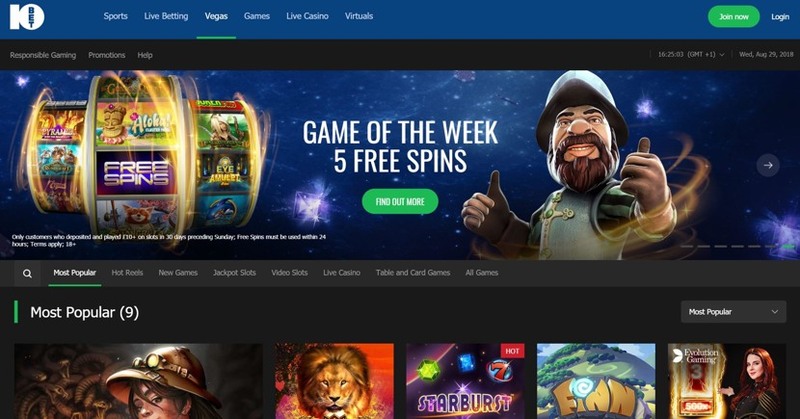 In recent times, the look and accessibility of 10Bet’s casino has improved and, while perhaps not the most aesthetically groundbreaking casino site, it has become a solid contender and has a loyal fanbase at its heart. 10Bet’s customer support service can be reached via phone, email, live chat – which is very handily available via instant messenger 24/7 – or by post. The support team promise to respond via email within 24 hours, although some questions may be answered for you if you select the options in the Help section once you have accessed the Contact Us page. Generally, agents answering questions through the live chat service are friendly and quick to respond. 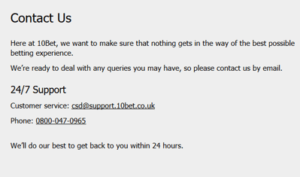 To get in touch with the 10Bet customer support team, choose from the options in the contact section below. Live chat – This can be accessed 24/7 once you are logged in. 10Bet has a gaming licence from the UK Gambling Commission: 43173.